Inspired by Munster’s rich heritage. Created from next generation materials. A future classic steeped in history. 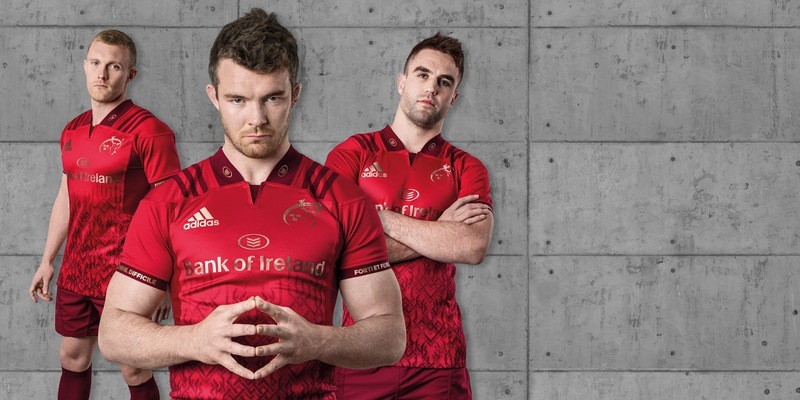 adidas and Munster Rugby have revealed the new Munster home jersey, which is available exclusively to pre order online from Life Style Sports on July 17th. The all red kit draws inspiration from the province’s rich heritage and shares the same Latin motto; forte fideli nihil difficil or to the brave and faithful nothing is impossible, that once decorated the ancient battle shield of one of Munster’s greatest families, the McCarthy clan. Hidden in the detail of the jersey, and in tribute to the Munster stag, is an antler tapestry, representing bravery, determination and fearsome territorialism. The Munster Rugby crest adorns the jersey in a timeless copper trim symbolising the gathering strength from Munster’s home soil and its history of forgotten ancient copper mines. The training range, available from July 17th, bears the tell-tale aerial signs of the provinces feeder townlands as seen on ordinance survey and grid maps. Once again Munster’s most creative and digitally engaged supporters worked side by side with adidas to create their own personal reveals of the new jersey, collated under the hashtag #NextIsEverything. “The 2017/18 Munster Rugby home and training ranges have that rare balance of classic style and modern flare that are rooted in the history of the team, the land and its people. "As we return to an all-red home kit, adidas have once again led the way in design and innovation in marking the province's heritage through the inclusion of the club's motto and nod to the stag, while also referencing our community ties with the map feature across the training range." The jersey is available exclusively to pre-order online from Life Style Sports on July 17th and available both in Life Style Sports stores andwww.lifestylesports.com from July 24th. Men’s replica jerseys are priced €80, Kids €65 - €75 and Test, as worn by the players, priced €100. Editor's note - We have received one or two comments from readers which amount to "Why are you promoting Munster jerseys if you're a Leinster blog?" (note - they are not all that polite!). Our content policy is such that while we are primarily concerned with all matters Leinster, should we receive promotional material we feel is relevant to Irish rugby in general, we are willing to help spread the word.